Fig. 4. Blunt trauma resulted in pubic rami fractures. Retrograde urethrogram reveals type 3 posterior urethral rupture juries may be classified as Type 1: posterior urethra stretched but intact, Type 2: tear of membranous urethra above urogenital diaphragm, Type 3: tear of posterior urethra above and below urogenital diaphragm, Type 4: bladder neck injury and Type 5: anterior urethral injury . 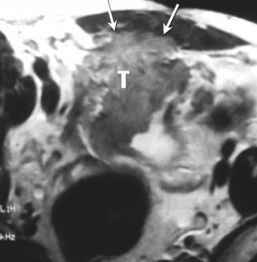 Although urethrography remains the standard, CT findings have been described in urethral injury, which may be useful if CT is performed as the initial study. 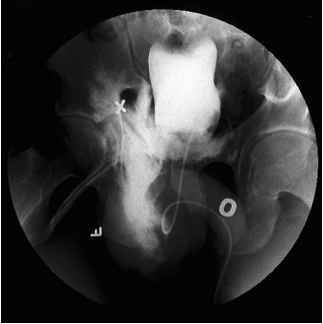 Obscuration of normal periurethral landmarks, in particular distortion or obscuration of urogenital diaphragm fat planes and hematoma of the ischiocavernosus muscle, are commonly seen in those with urethral injury . Alternatively, completely normal perineal anatomy may exclude significant injury, but further investigation is needed. may be due to splenic or other injuries, or pelvic fracture. Extravasation low in the pelvis, not outlining bowel loops (and which may extend up the retroperitoneum) indicates extraperitoneal rupture that most often can be managed conservatively. Extravasation high near the dome outlining bowel loops or extending to the gutters or higher indicates intraperitoneal rupture, and is more often managed surgically . Bowel and mesenteric injury are found in about 5% of patients having surgery for trauma, seen in 0.7% of traumatized patients [1, 16]. Mechanism of injury is direct compressive force, including from seatbelts, although deceleration may play a role. Morbidity and mortality can occur if peritonitis and resulting abscess are missed. 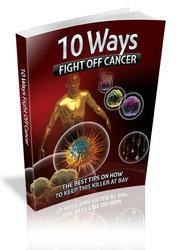 Clinical signs and symptoms are non-specific. Although positive diagnostic peritoneal lavage (DPL) or free fluid on sonography may be due to bowel or mesenteric injury, these findings are non-specific . Although some have commented on the difficulty of correct diagnosis by CT, CT is the most accurate diagnostic modality, with a reported sensitivity of 88-96% and a specificity of 80-99% [16-20]. Use of oral contrast, and early scanning after rapid injection of high volume intravenous contrast allows detection of extravasation . Active bleeding is seen as a focal collection with at-tentuation similar to the aorta at the same level and different from the adjacent organ. Contrast extravasation, whether intravenous contrast from a mesenteric vessel or oral contrast from the bowel lumen, is the most specific sign of mesenteric or bowel injury, but is not common -it was seen in only seven of 26 patients with bowel injury . Free air is thought to be a good sign of perforated bowel, but in fact it has limited value; it is infrequently seen in those patients with bowel injury, and may in fact represent air tracking into the peritoneum from thoracic injuries. Free air was seen in only 28% of true positive CT scans, but in 2% of false positive scans . The commonest finding was unexplained free fluid, even though 70% of those with only unexplained free fluid had no bowel injury. 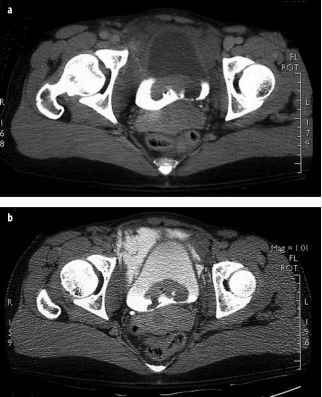 Other findings, such as focal bowel wall thickening, interloop fluid, mesenteric stranding or frank hematoma are often seen (Fig. 7). If a single finding is seen, likelihood of injury is low; a combination of findings, particularly free fluid without an obvious source in combination with focal bowel wall thickening and/or mesenteric stranding is very suggestive of bowel injury and such patients should be further explored or followed very carefully. Oral contrast presents a risk, although low, of adverse events, including aspiration pneumonia. Given this and the low rate of visible bowel contrast leak, some have questioned the use of oral contrast to detect bowel injury. One study of 1,000 patients  and another of 500  showed similar accuracy to previous reports with oral contrast - with a sensitivity of 82-95%, and a specificity of 99%. At our institution, the use of oral contrast has been discontinued in trauma patients with no recognized ill effect. The spleen is the most frequently injured abdominal organ in blunt trauma. There may be signs of blood loss, or left upper quadrant pain, but the diagnosis largely rests on imaging or surgical exploration. A trend towards nonoperative management is supported by evidence that long-term health is better in those who have had splenic function preserved. This necessitates accurate non-invasive diagnosis, and is aided by signs predictive of success or failure of conservative management. Splenic injuries can cause free fluid, perisplenically or elsewhere, which can readily be detected by sonography. Splenic injury may alter echo texture: lacerations may be anechoic if there is rapid bleeding, but are more commonly more echogenic than normal spleen . With such findings on sonography, the decision whether to further evaluate with CT or to proceed to surgery can be made on clinical grounds (Fig. 1). Splenic injuries may be missed by sonography, particularly if not associated with free fluid. In one large study, there were 43 false negative sonograms, including six splenic ruptures that required surgery . CT is quite sensitive for the detection of splenic injuries . Subcapsular hematoma is seen as a crescentic low attenuation peripheral rim, and intraparenchymal hematoma is seen as a rounded area within the spleen with low attenuation and no enhancement. Lacerations are common, seen as linear or branching low attenuation lesions which often extend to the surface, often associated with perisplenic or free fluid (Fig. 1, 2). Hemoperitoneum tends to be higher attenuation close to the source of the bleeding; thus when the spleen is the source, the collection adjacent to the spleen may be higher in attenuation than elsewhere (Fig. 1), the sentinel clot sign. Lacerations may involve the vasculature. There can be devasculariza-tion of the spleen by hilar injury. 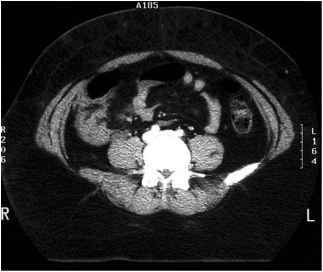 There may be active extravasation into the peritoneal cavity or a confined area of extravasation - a pseudoaneurysm (Fig. 2). Both types of extravasation indicate that non-operative management may not succeed, although angiographic embolization may control the bleeding and allow splenic salvage . Fig. 7. Motor vehicle collision. Focal hematoma and thickening of cecum; cecal laceration was found at surgery the need for intervention. Angiographic embolization has similar outcomes and less morbidity compared with surgery . The liver is the second most frequently injured abdominal organ, accounting for about 20% of abdominal injuries [1, 24]. The right lobe is more often affected than the left, with the posterior right lobe being the most frequently injured segment. Hepatic injuries may be associated with intraperitoneal hemorrhage, but injury may be confined to the liver, or hemorrhage limited by an intact capsule. Laceration of the bare area is associated with extraperitoneal fluid . US may show liver lacerations, which appear similar to splenic injuries, but US has a limited sensitivity of 67%, compared to 93% for CT . This is in part because of the large size of the liver, and the difficulty in clearly imaging all portions by US. Injuries to the liver include contusion, seen on CT as an ill-defined area of low attenuation; subcapsular hematoma, a crescentic collection limited by the capsule; and intraparenchymal hematoma, a collection of blood within a liver laceration. Laceration is the most common, with linear or branching low attenuation regions, sometimes with jagged margins, that can extend to surface or to vessels. Periportal low attenuation is usually due to edema, but it may represent blood tracking along portal veins. Rarely, this is the only sign of liver injury [1, 24]. The most severe, and rare, injury is avulsion of the hepatic pedicle . Liver injuries may require surgery, but 50-90% can be managed non-operatively. The liver, with a dual blood supply, is relatively resistant to infarction, and has considerable functional reserve. No CT signs or grading schemes have been shown to be reliable predictors of which patients will require intervention. However, active extravasation may predict a need for surgery or angioem-bolization. The presence of hepatic arterial extravasation or extension of injury into hepatic veins correlates with the need for surgery . Subclassification of extravasation can be useful: extravasation into the peritoneal cavity is highly correlated with the need for surgery, intra-parenchymal extravasation with significant hemoperi-toneum may require surgery, while extravasation limited within a hepatic hematoma without hemoperitoneum can usually be managed conservatively .